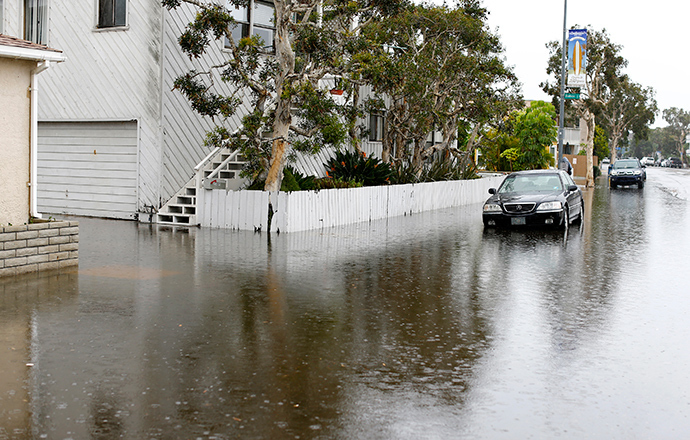 Authorities are still on the lookout for mudslides after a major storm hit draught-suffering Southern California on Friday, causing floods and burying homes. 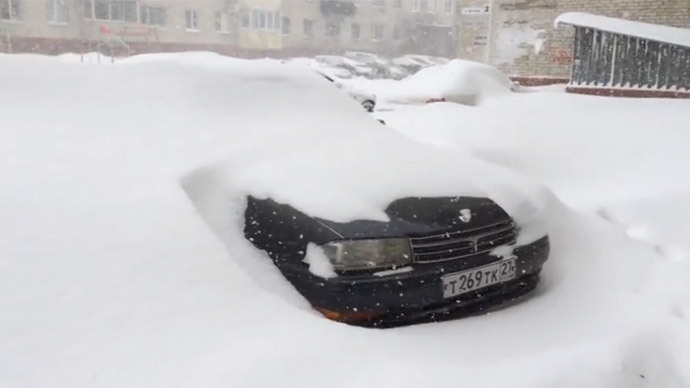 Tens of thousands were left without power and dozens of evacuations were ordered. 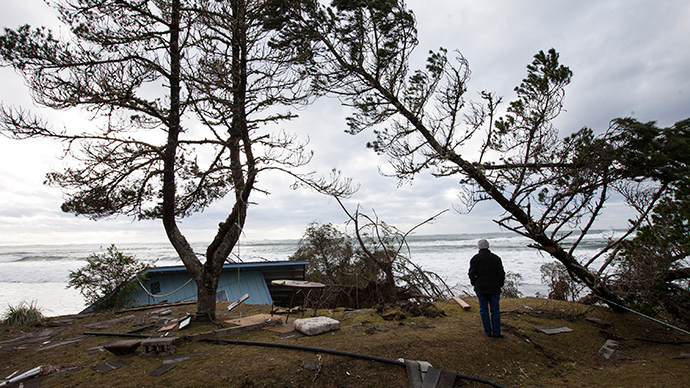 The storm moved in from Northern California with five inches of rain falling down, causing random landslides and debris. 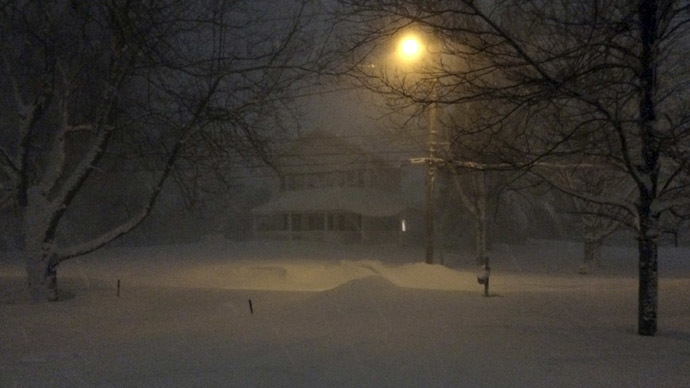 At least 10 homes were completely wrecked, according to AP. 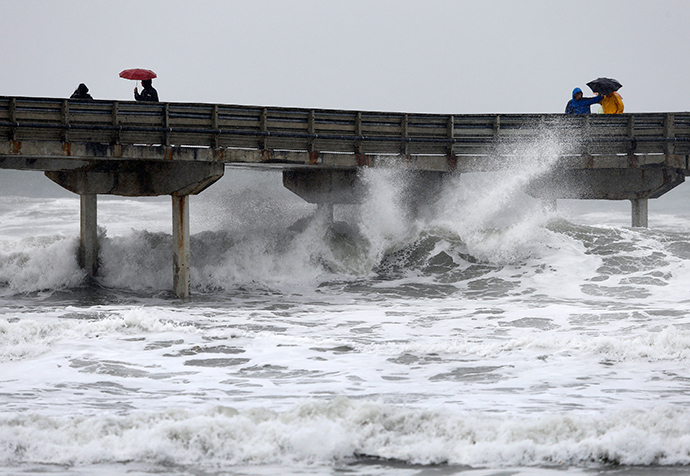 Up to 50,000 people lost power as the wind speed reached up to 60 mph in some areas and street flooding was reported. 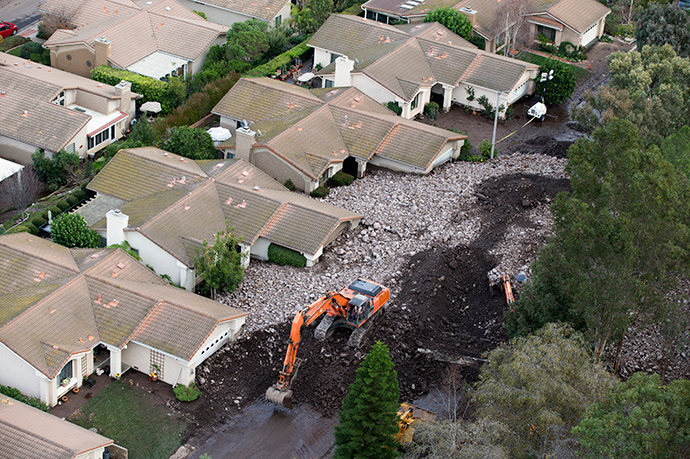 A mudslide coming from a hillside around 50 miles (80 km) from Los Angeles, in the city of Camarillo, covered up dozens of homes with debris, including silt, sticks, and rocks – some of them as big as a table. Some of the houses were covered up to their rooftops with debris. Local authorities ordered at least 124 mandatory evacuations from the area, according to Ventura County Sheriff's Capt. Don Aguilar. Meanwhile, 40 people were displaced following the storm’s damage and two people taken to hospital. The landslide was so powerful that two large earthmovers used as a barrier were knocked over and one of them was almost completely buried. 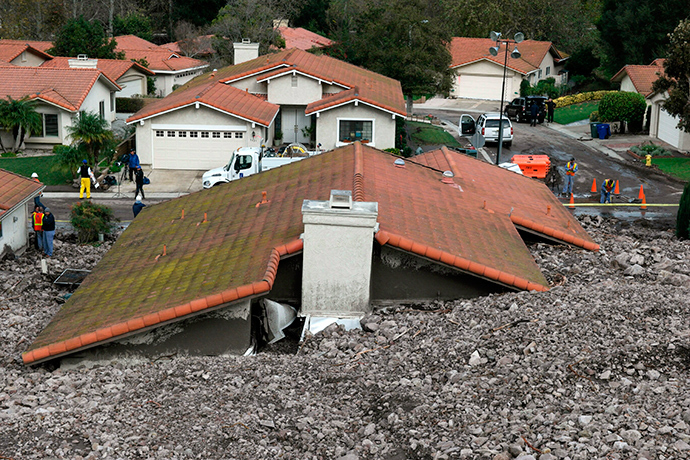 The suburb of Glendora, located east of Los Angeles, witnessed rocks and bricks flowing down the streets, police Lt. Matt Williams told AP. 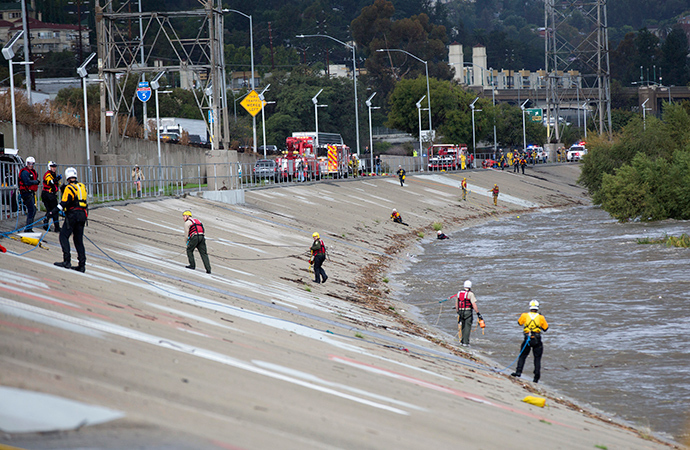 Fire rescue teams were involved in saving two people from the Los Angeles River on Friday. California has been suffering from a draught, so the rain was welcomed. 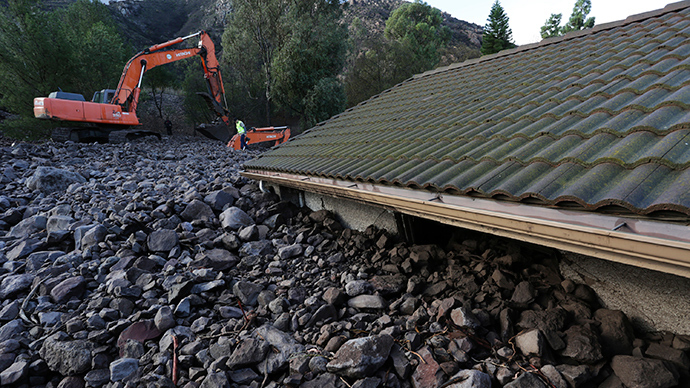 But as the sudden downpour caused mudslides, authorities called on people to remain vigilant. Rescuers remain worried about hills affected by wildfires in the past, fearing that the soil, which is no longer supported by roots, could be swept away. 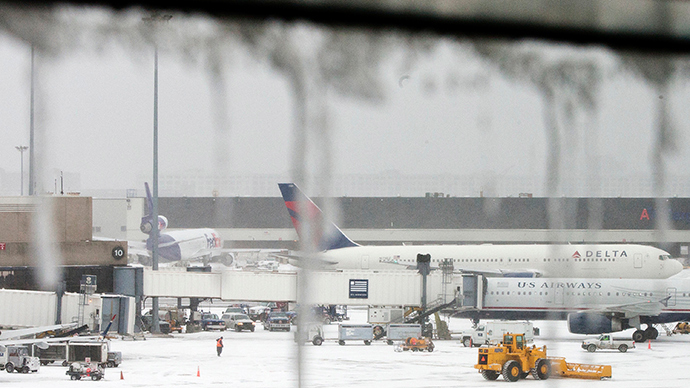 Weather forecasts project that the storm will move east and head towards Nevada and Arizona.